We have seen so many discussions lately on a variety of groups and forums and wanted to create a general guideline that we will hope clarify how to manage your WordPress posts in regards to categories, posts and other archives. What Is A Category/Category Archive? Categories are used to group your content into a “main topic”, for example if you are a car blog you may have a category for each car manufacturer. The goal of categories is to help your readers find the content they are looking for easily in a more broad term. Think of categories as the chapters of a book! If someone lands on your website and they are looking for information about their Maserati – you will want to have a category for that particular car brand so they can access all the information about that car. What Is A Tag/Tag Archive? A tag is a way of further refining your content. So, for our car blog which currently has car models as their categories, we may add tags for “engine”, “body”, “transmission” etc. This way they can find the detailed information about the car topic they need. Think of tags as the index of a book! Tags should NOT be a dumping ground for content. It should be well thought out and planned. Use keyword research and consumer question resources to find what people are looking for and create tags around those topics. What Is An Author Archive? What Is A Date Archive? If you are using categories, tags, author or date archives and not implementing them properly there can be issues with rank and usability. We will cover some of the biggest issues below. One of the biggest issues is duplicate content – and while we do not believe Google will penalize a website owner for duplicating content on their own website – it is not a risk worth taking and there are other things that can make it a problem. As an example – you create a new post and place it in a category and then give it a tag. This means that your 1 post will show in a minimum of 5 different areas on your website – in essence it is being “duplicated” 5 times since each of the above are unique pages to the search engines. Now imagine if you are putting that post in MULTIPLE categories and tags – then duplicating it even more. This is the main problem with poor management of post and tags. The next issue is “thin content” which basically means pages that offer no real value to search users or visitors. Thin content pages have no clear focus and offer little in useful content. Typically any archive page: category, tag, author or date are considered thin content pages. We will use playfulkitty.net as an example – thank you Robin! She ranks for a term “kellas cat” – but the page that actually ranks for that term is a tag archive called “kellas-cat”. YAY for having rank, but NAY for having a tag archive rank over the post itself. Below is a screenshot of the tag that ranks in the search results. First – please DO NOT use tags for just 1 post, this is just bad practice overall – tags should refine a search if there is only 1 post then clearly it is not part of a larger category. Second – the tag is outranking the post – you want the post to rank first – you want visitors to land right on the content they want when they want and to click as few things as possible to get there! Third – actual thin content! The good news about the post itself is that it DOES rank for about 90 keywords, so she is doing a great job with her optimization but that post itself does not rank for “kellas cat”. We wonder if she did a noindex on the tag “kellas cat” – or removed it entirely if that post would then rank for that term. This is a big one to us. When we develop a website – user experience is first and foremost. When a person does a search they want to get to the most relevant content they can – not having to jump through hoops to get there. In the screenshot above you can see the title of the page is “Kellas Cat Archives – Playful Kitty” with a meta description that makes no sense at all because if no meta description is entered search engines pull whatever they can from the site. This does not at all make users want to click on this search result….it offers no call to action, no detail about what a user may find on the page or anything to encourage a click. Click through rates (CTR) have been said to improve rank – although Google will deny it – so it is critical that you take care of how you show in the search results and WHAT is shown! If you have tags and category pages ranking – then they will land on a page with a lot of posts — not the specific post that can help the which means they have to find a post they want to read – and if your post titles are not well written this could be a problem. With Google constantly changing their algorithm and more focus given to websites that provide a great user experience – having archive pages rank can be causing issues with your overall rank for core keywords. Things like bounce rate, time on site and even direct traffic are becoming big indicators of a quality website that will rank higher so it is CRITICAL that you evaluate where you are losing on these items. But My Tag Archives Rank Well! Yes – you can argue that ranking a tag archive page is a good idea and you would rather they see all the posts you have in that tag – we accept that but our preference is to give the user the exact content they are looking for and not make them search for it in a list of posts. If you do think keeping your tag archives indexed is a good idea – we suggest you look at your analytical data to prove it. Let’s run an example – thank you to Carol at fidoseofreality.com for letting us use her as a guinea pig for this analysis. If I do a search for all of the tag archive pages she has indexed, I see she has 1,910 tag archive pages – um, yeah that is a whole lot of tags going on. If I peak in the admin I can see they actually have 2830 tags being used….YIKES! So this means about 500 tags are not being indexed at all at this time. You can even see the very first tag is “2013” in which they have 1 post. Since there is a date archive there is really no need to ever use dates as a tag. But most of the tags on the website have very few posts in each tag…..but her site has been around a long time and back in the day the “more tags more rank” was the philosophy so I understand why it is this way right now! But, now it gets interesting! 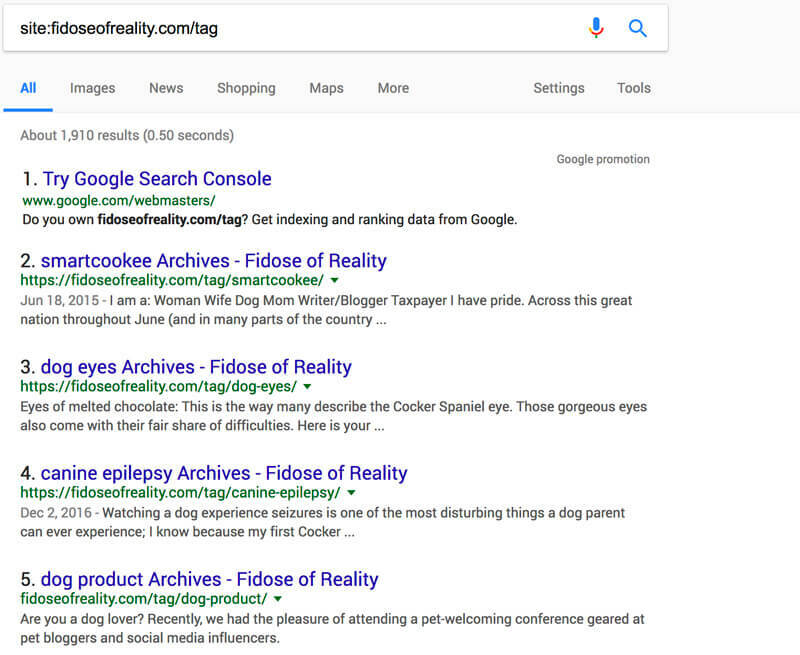 In one of our tools we are able to see all of the tag archive pages that Fidose of Reality actually ranks for – if they have 1,910 tag archive pages indexed you would thing a lot of pages rank right? WRONG! Of the 1,910 tag archive pages that are indexed – it looks like only 9 of those pages actually rank for any keywords — and it is only 62 keywords that even rank for those pages! PROOF: You can see below how we filtered for any pages that had the term “tag” in it and it only reflected 62 words that rank for any page that is a tag archive. We manually counted the tag archve pages that rank and while it is now shown here – it was only 9 pages! Playful Kitty has 631 tag archive pages indexed as shown below. But of those 631 pages that are indexed – a whopping 4 rank for anything in the search engines. Still not convinced that tags really should not be indexed? Below is the traffic to the Fidose of Reality tag archive pages for the last 30 days (Aug 8 – Sep 6, 2017). So far the last 30 days they have had a total of 27 unique pageviews to any tag archive page. But it is also important to note the time on page is only 19 seconds compared to her average website time on page of 4:51. This could be sending a very bad signal to the search engines that visitors are not responding well to the content on that page. Clearly the use of tags in terms of the search engines are not anything great. In this specific case they are not really doing any benefit at all since the huge amount of tags that are being used are not helping their users either. 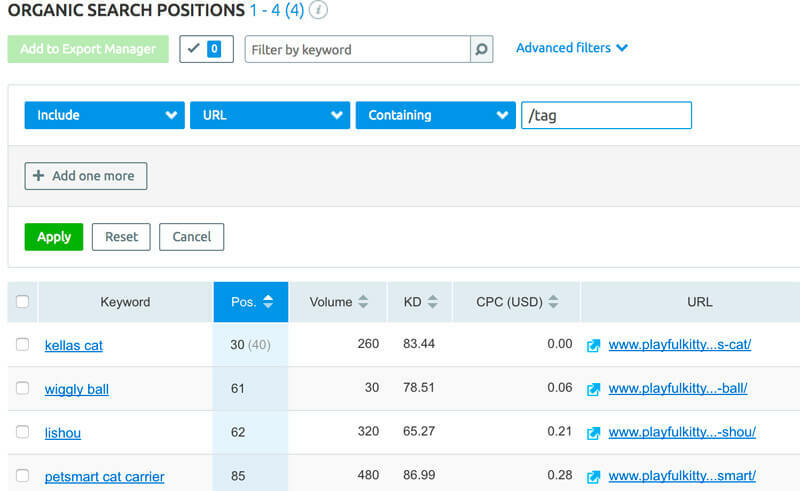 Review analytical data to determine if any tag archive pages are seeing activity. The fact that we see 27 unique pageviews in a 30 day period for a website that had over 56K unique page views tells us that tags are offering no real value and are not being utilized. If we find that tags are really not being used, not ranking well and have no traffic – stop using them. If we stop using them – then we can no-index them and remove them from the website. To avoid 404 errors for the few visitors that may land on an indexed tag archive page we implement 301 redirects so they land on either a post or even just the home page. Or you can customize the 404 page to include a great search and sitemap! 1) Categories/Category Archive – there is no right or wrong amount of categories but we do try to limit them so it is not overwhelming. While some recommend no-indexing categories to avoid duplicate content issues – we prefer to let them be indexed and CUSTOMIZE them so they are unique in terms of content. For example: https://www.2dogsdesign.com/category/wordpress-news-and-tips/ you can see we added a block of content above the posts to help give some unique content. We also customize the title and meta description for every category we create! 2) Tags/Tag Archive – unless you really have a massive amount of content we do not even recommend using tags. If you choose to use tags – think them through carefully and make sure they make sense and offer value! Tags should be a secondary way to find important content and tag archives should not include just 1 post. Tags should be NOINDEXED and only used to help your readers find content. Your tag pages should not be indexed in the search engines. Tags DO NOT HELP WITH SEO so if you think they do and that is the only reason you are using them, then stop! See the data above for proof. 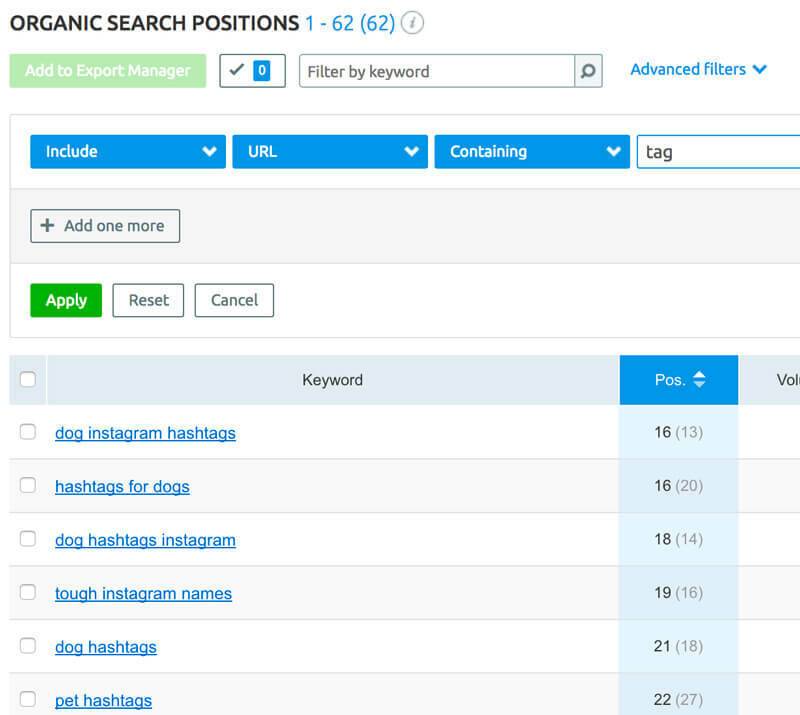 5) Search – instead of tags – implement a more aggressive search functionality to help users find what they want without having to sift through your tagged posts! In any SEO plugin there should be a setting you can use to no-index certain parts of your website. 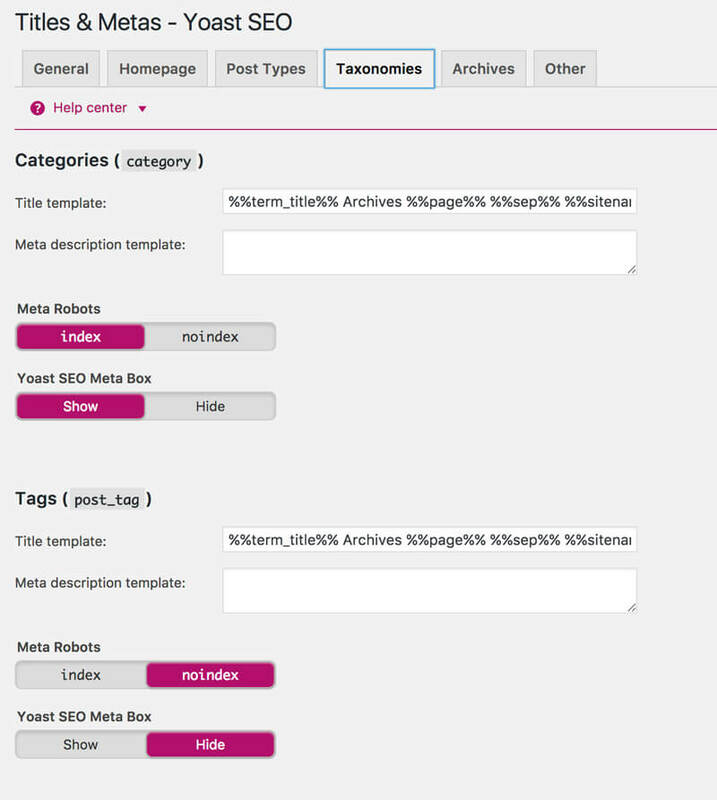 Below is a screenshot showing where you can no-index your tags in Yoast SEO. You can see we have our categories set to index while our tags set to noindex. We do not use tags at all on our website anyway, but if we did, they would not be indexed in the search results. This is the biggest problem i’m having. My articles are not being ranked but my tags are everywhere on Google. Very insightful article. Will implement the change now. Hi Kanyi – just make sure you do not have tags that draw traffic or have a lot of keywords ranking before you remove them so you can redirect them and not lose what you have! 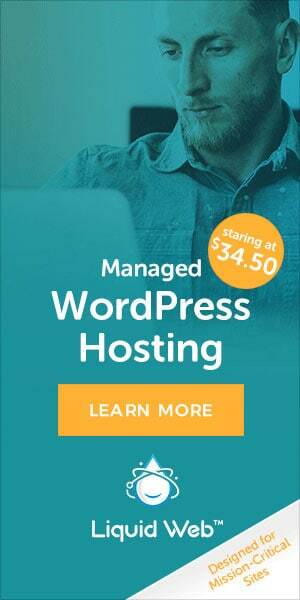 Hi great post, I have a query I am using wordpress. I always set no index to tags using yoast seo plugin, but for some reason, for only 1 post I want my tags to get index is there any why I can accomplish that. Any help would be highly appreciated. I may be a little confused what you are asking – but if you want 1 tag to be indexed you would need to write some custom code then to have all of them no indexed except that one.